On April 23, a 2 year old moon bear escaped from a nearby bear farm in Yongin, Kyonggi-do, Korea; only to be swiftly gunned down by police-led professional hunters. 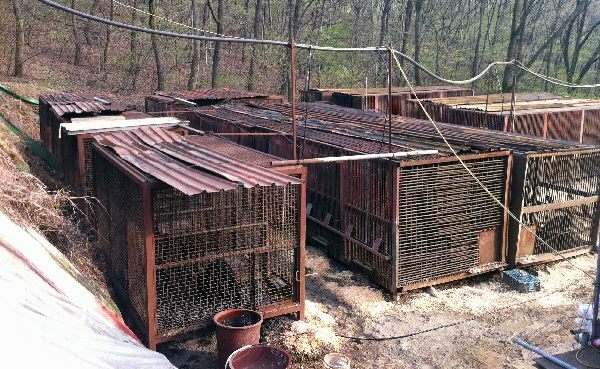 The farm from which the female bear escaped was found to be an illegally operated facility. It currently holds no license, and is believed to have been in business since 2003. 105 bears reside within the shoddy enclosure, which contains over 40 small dens and poorly secured cages. Residents nearby expressed fear toward the animals whom they believe could “easily escape”. No drainage facilities have been found in the vicinity. Police discovered a tube wound on the neck of the dead bear, indicating illegal practice. We urge all animal advocates to write a letter to the Environmental Ministry of Korea, urging strong punishment for this farmer, and those who participate in bear bile farming illegally. 반달곰이 경찰의 총에 맞아 쓰러져 있습니다. 이어서 야생동물협회에서 나온 전문엽사가 다시 방아쇠를 당깁니다. 이 곰은 오늘 아침 8시 반쯤 경기도 용인에 있는 사육농장에서 도망쳐 나왔습니다. 5시간 뒤인 낮 1시 50분쯤, 인근 등산로를 산책하고 있던 50대 여성이 이 곰과 맞닥뜨렸습니다. 이씨는 곰을 피해 나무 위로 올라갔지만, 곰은 끝까지 쫓아 올라가 다리를 물어 상처를 입혔습니다. 다행히 거센 발길질에 곰은 다시 달아났고 이씨는 병원에서 치료를 받고 있습니다. 곰은 경찰과 소방관, 전문엽사 등 200여명이 수색에 투입돼 탈출 10시간만에 현장에서 사살됐습니다. 해당 농장은 사살될때 까지 경찰에 신고조차 하지 않은 것으로 조사됐습니다. 앞서 지난 해 12월에도 인근 농장에서 곰이 탈출했다가 사살되는 사고가 발생해 곰 사육 농장에 대한 체계적인 관리가 시급하다는 지적이 일고 있습니다. Absolutely disgusting !! How can humans do this ? Please stop this evil farming illegally using these beautiful bears in this barbaric manner. Surely you must see this is wrong. This must be stopped and banned and the farmer needs to be punished for this cruelty. You have to take irresponsibility for deterring your people from running these illegal farms, strong punishment should be given to this farmer for his barbaric torture of these poor animals, it is time for you to put a stop this torture once and for all.. This has got to stop. This is an extremely cruel practice. Have written a letter and will post it shortly. I have heard about the 2 year old moon bear being shot on 23 April of this year. It has also transpired that the bear in question was part of an illegal bear farm in Yongin, Kyonggi-do, Korea. I know that you have talked about your opposition to illegal bear farms, perhaps your reason for this was to pacify the majority of decent people who are in opposition to this intolerably cruel practice, but now you have been presented with an opportunity to declare, to the world, that you have action behind your words. The cruel treatment of these bears in this illegal farm warrants a very harsh sentence indeed. This harsh sentence will send out a message to the world that you mean what you say, you mean business, you mean to stamp out this kind of illegal practice. It will also deliver a message that those who perpetuate this kind of illegal activity should expect their justice to be equally harsh, equally deserved and that justice will have been seen to have been done. We thank you very much for taking the time to do this. We appreciate your outrage and share your frustration, certainly. However, we feel it is important to note that generally, Korea “as a nation” has shown to react with horror when educated about the trade, and is currently taking action to end it. In national surveys, 98% of Korean nationals claimed they believed bear bile farming was wrong, and should be stopped. We DO understand your anger. We, too, feel anger and sadness. Still, we believe that is important to clarify that the guilty parties are not necessarily “the culture or nation”, rather, indivuals or specific groups with financial interests or ignorant views.Thank you for your passion. To the ‘people’ that are capturing, terrifying and torturing these helpless animals, you are a filthy disgrace. What a vile & perverted bunch you are. I have nothing but hatred for you and your kind. Those that have no heart or compassion for animals, you’re sick! Oh and uh here’s a news flash for you, YOU are no better than any other living creature. In fact, you’re nothing more than a pile of bear excrement! We are pleased that Korea is finally taking real action to end the trade and are eager for the day that the law changes. Thank you for your passion. This is one of the most disgusting things that humans do. The poor bear who escaped probably had a better end (even though sad and regretable) than the slow painful death inflicted on her on this farm. Please stop this! This needs to stop…and if I’m honest I have had a guts full of selfish humans…these people are barbaric..